What a Year for the Farmers Market Nutrition Program! As November has come and passed, so too has another season for the Farmers’ Market Nutrition Program (FMNP). FMNP is a seasonal program that SFC runs in collaboration with the Texas Department of Agriculture and Texas WIC. 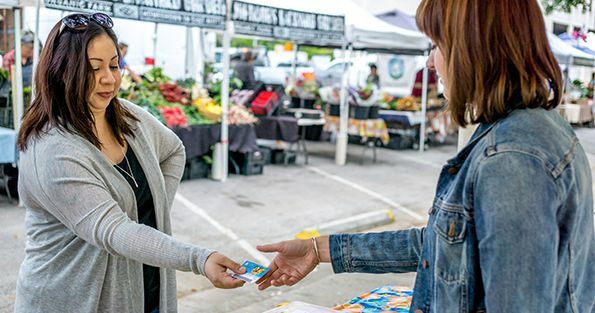 Each year, from April to October, families who participate in WIC (Women, Infants, and Children) can receive a set of vouchers to purchase fresh and seasonal fruits and vegetables from Texas farmers. We match those vouchers through SFC Double Dollars so that families can purchase even more locally grown, fresh fruits and vegetables! This program provides many benefits to the local community. It introduces new customers to local, seasonal eating and improves access to nutritious foods. It generates more sales and income for local farmers, all while building healthier communities and boosting the local economy. This year was a bigger success than ever before! Between the SFC Farmers’ Markets Downtown and Sunset Valley, and the Texas Farmers’ Markets at Lakeline Mall and Mueller, we distributed 2,512 voucher booklets. A total value of $75,360! With both the vouchers and the matching Double Dollars, local farmers received $89,146 in additional revenue. Although SFC has been operating this program for 19 years in the Austin area, we are constantly improving and innovating on our process. This year we introduced the Triple Dollar WIC days to coincide with FMNP season. Through this joint effort, we generated another $25,466 in fruit and vegetable sales. Leading to a grand total of $114,612 during the months of April through October!! Imagine all that fresh, locally grown food on the plates of families that would otherwise have more limited access to nutritious options and all that extra income for hard-working farmers they would otherwise not have. The Farmers’ Market Nutrition Program truly provides a great service to our community. We are eager to get the next season started!